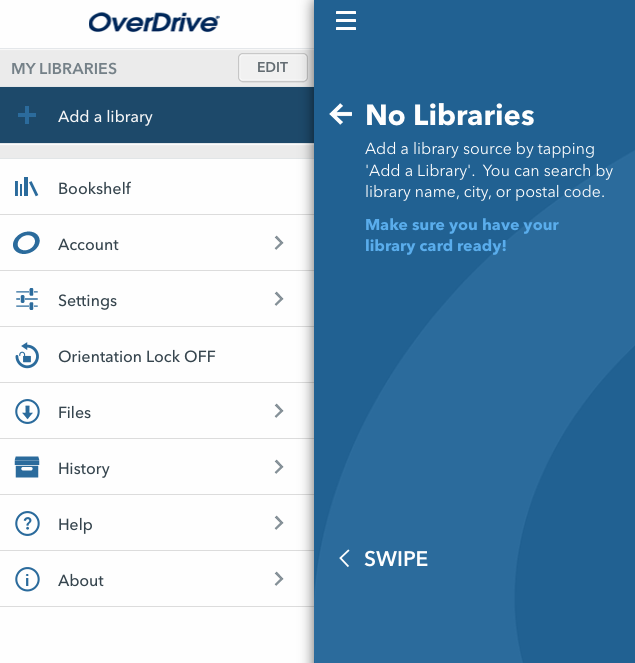 Option 1: OverDrive Read is a quick way to get started reading eBooks in the browser of your mobile device. 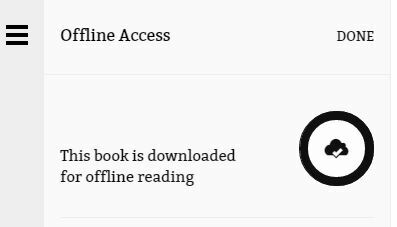 In some browsers, you can also download and bookmark the eBook for offline access. Option 2: The OverDrive App will allow you to download EPUB eBooks and MP3 audiobooks for a variety of tablets and smartphones. Option 3: The Libby App - think of it as a newer, more streamlined cousin of the OverDrive App. Downloading ebooks directly to a tablet or smartphone is relatively straightforward. The details will vary slightly depending on the type of device – Android, Apple, Windows 8, etc. – but the basic steps are outlined here. No need to install an app, or authorize with an Adobe ID or with an OverDrive Account! Simply click on READ (in your browser). NOTE: OverDrive Read works best when using Chrome or Safari browsers. To read offline (no internet), tap the centre of the screen. The OverDrive Menu will either show on the left side, or as three lines in the top left corner. 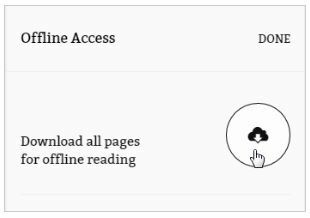 Select Offline Access from the OverDrive Read menu, then tap the cloud icon to cache (download) an eBook so you can read it offline. 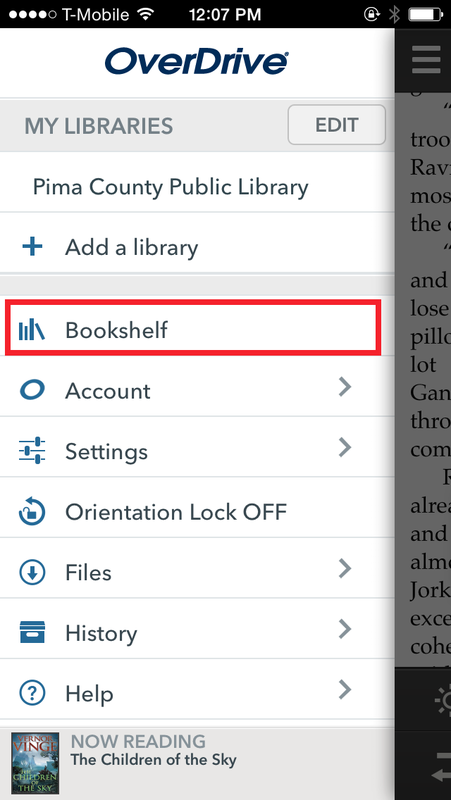 Either bookmark the eBook in your browser for easy retrieval, or add a shortcut icon to your home screen. On Android devices, tap the menu button (three dots, or three bars), and tap Add to Homescreen. On iOS devices, tape the share button, tap Add to Homescreen, and tap Add. For more details, read OverDrive's How to Use OverDrive Read. Sign up for an OverDrive Account (if you don't already have one, follow the prompts. This will allow you to read an eBook across multiple devices and sync your progress and bookmarks. You can create an account using your library card or email address). Note: OverDrive will send a verification email if you include your address in the registration process. When you find an available title that you’d like to read or listen to, tap on the item to select it. 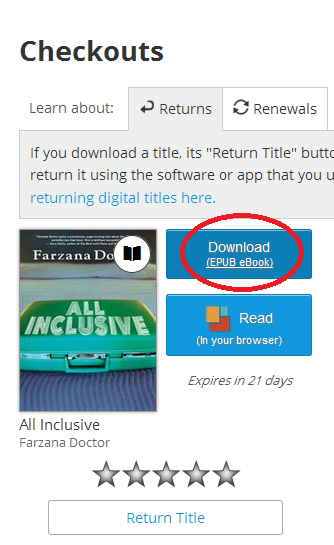 You can click the Sample button to read or listen to part of the title before borrowing. You will be taken to the Library Bookshelf section of your account. The title is now checked out to you. The next step is to download it. You can complete the download at any time during the loan period by signing in to your account and going to the Bookshelf section. Select a format if necessary and tap the download button. The book will begin to download. The process is very simple. The app itself will walk you through registering your card. If you want a trial run, Libby’s website can walk you through the process. You’ll see an image of a smartphone with a button marked “TRY” at the bottom – click on the “TRY” and it’ll walk you through the process of registering your library card. You can register several cards and, within the app, switch between them. To browse the collection, tap on Explore. From here you can browse the collection is many ways, including by new or popular titles. Once you find a title you're interested in, if it is available if will "Borrow", if it is checked out you'll be given the option to "Place Hold"
You can download a title after checking out by tapping "Read Book". 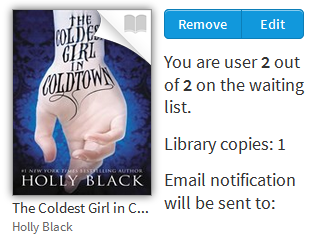 When browsing by genre or format, it is possible to hide all items that are currently checked out - look for the blue box on the left side of the screen that says Show me only titles with copies available. 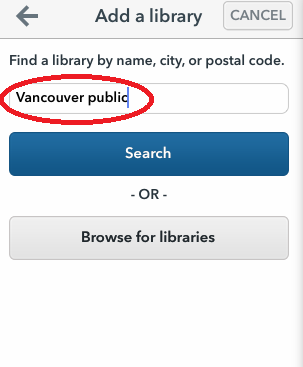 Sign in to your VPL to Go account with your library card number and PIN - Note: this is a separate account from My VPL where you would manage your library account for both physical and eBook/eAudiobook materials. Not finished with your eBook or downloadbale audiobook? 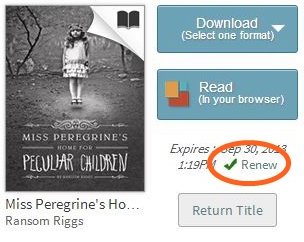 Click on the Renew icon to place an advance hold on titles you currently have checked out. Renewing puts you in line to borrow a title again once your first checkout expires. The option to renew a title becomes available three days before the title is set to expire, appearing next to the title on your Bookshelf in your VPL to Go account. You can only use the renew feature once for each checkout. If there are no existing holds on a title, the Renew icon will be green (see example below). You can borrow this title again immediately once your first checkout expires - Note: you will need to re-download the eBook. If there are existing holds on a title, the Renew icon will be greyed out (see example below). You can still use the renew feature to reserve a spot on the title's wait list so you can borrow it again as soon as it's available. 3. 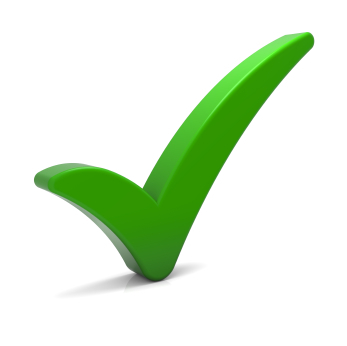 Enter and confirm your email address in the renewal form, and click the Renew icon - the Renew icon on your Bookshelf will now have a green checkmark next to it (see example below). eBooks and downloadable audiobooks are returned automatically after their lending period has expired. 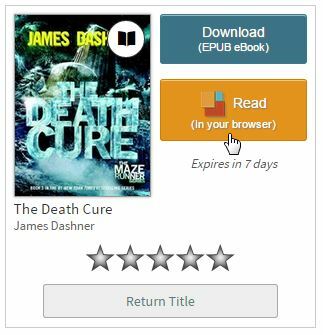 When a title expires, you can simply delete the expired book from your device. For information on returning a title before the expiry date, please visit How to return titles before the end of your lending period.